Superstitions in the UK #infographic ~ Visualistan '+g+"
From the moment we wake up, it may feel that superstitions are controlling our actions. A survey conducted by Mecca Bingo has confirmed that many brits are unsurprisingly a very superstitious bunch. The data suggests that a third of Brits rely on lucky charms, and many complete certain behaviours to ward off bad luck, “just in case”. 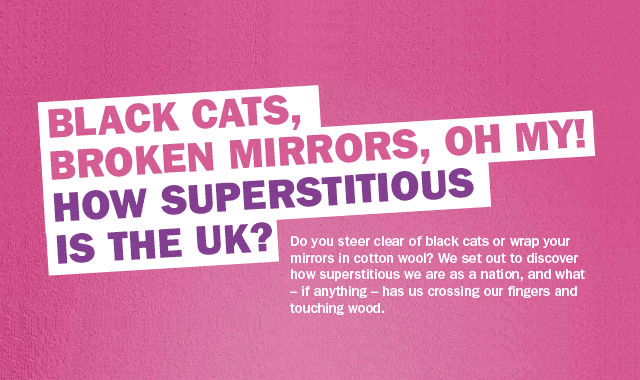 The study found Brits are certainly not willing to risk it when it comes to something which may affect their luck, with over 40% of the UK admitting superstitions are unlikely to come to anything but they carry the rituals out anyway. Nearly half of Brits (40%) believed bad luck would fall upon them for seven years if they broke or smashed a mirror. While 30% of brits avoid walking underneath ladders, a superstition actually originating in accident Egypt. Probably most interestingly, many brits believe in luck charms that will bring them luck, including clothes. With many of us (36%) owning a lucky pair of underwear. The Welsh are the most superstitious with almost half believing breaking a mirror and walking under a ladder will bring bad luck. A third of those living in the North East refuse to put an umbrella up indoors or put shoes on a table and two in 10 people living in the South West will always salute a magpie. Scots rely more on lucky charms, with almost a quarter seeking out a black cat to bring them luck, almost half of the Welsh turn to lucky pennies and wishing on shooting stars, while over 40% of those in the North East look to more traditional rituals such as crossing your fingers and finding a four leaf clover. Take a look at the interesting findings in the infographic below to see how many people reply on rituals, charms and superstitions to bring them that lucky feeling.